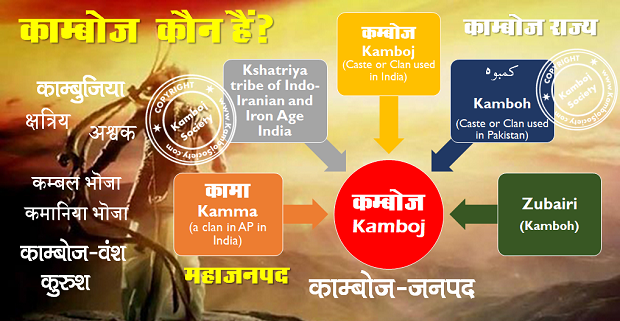 Who are these Kamboj people? Kamboj people are an ethnic community of the Punjab region of India and Pakistan. The Kamboj people are a traditionally agricultural community in Northern India and Pakistan. Primarily of Hindu, Muslim and Sikh faiths, they now live mostly in the Indian States of Punjab, Haryana, Delhi, Rajasthan, Uttarakhand and Uttar Pradesh and the Pakistani provinces of Punjab and Sindh. Kamboj People (Punjabi:ਕੰਬੋਜ, Hindi:कम्बोज, Urdu: ک…بوہ‬‎ ) also known as Kamboh (Punjabi: ਕੰਬੋ, Hindi: कम्बो, Urdu: ک…بوہ‬‎ ). Kamboj is frequently used as caste name or surname or last name in lieu of the sub-caste or the gotra name by many Kamboj people currently living in India. Their Muslim counter-parts living in Pakistan mostly use last name Kamboh instead of the gotra name. A good many Muslim Kamboh are also found in the Doab region of Uttar Pradesh, India, especially in the town of Marehra, and call themselves Zuberis. The Kamboj people are the modern representatives of ancient Kambojas, a well known Kshatriya tribe of Indo-Aryans, stated to have had both Indian as well as Iranian affinities and mentioned in ancient Sanskrit texts and epigraphy. The Kambojas were an Indo-European Kshatriya tribe of Iron Age India, frequently mentioned in (post-Vedic) Sanskrit and Pali literature, making their first appearance in the Mahabharata and contemporary Vedanga literature (roughly from the 5th century BCE). Their Kamboja Kingdoms were likely located in regions on both sides of the Hindukush (see Kamboja Location). They apparently qualify as an Indo-Iranian people, better as Iranians, cognate to the Indo-Scythians. "It seems from some inscriptions that the Kambojas were a royal clan of the Sakas better known under the Greek name of Scyths" . In the wake of Indo-Scythian invasion of India during the pre-Kushana period, Kambojas appear to have migrated to Bengal, Sri Lanka and Cambodia in the period spanning the 2nd century BCE and the 5th century CE. Their descendants held various principalities in Medieval India, the one in north-west Bengal being seized, around middle of tenth century CE, from the Palas in Bengal. During the early years of Islam in India, one of the groups of this clan embraced Islam at the instance of Shaikh Bahauddin Zakariya Suhrawardi (of Multan) and his son Shaikh Sadruddin. Some Kamboj, such as Shahbaz Khan Kamboh, occupied key military and civil positions during the Turkic and the Moghul reign in northern India. The historian M. Athar Ali said that "The Sayyids and the Kambohs among the Indian Muslims were specially favoured for high military and civil positions during Moghul rule". As per the Hindu varna system Kamboj belongs toKshatriyas in the caste system.Chudakarma Samskaara of Paraskara Grhya-Sutram ,Vamsa Brahmana of theof the Sama Veda, the epic Ramayana as well as Mahabharata and some other ancient references attest that a section of the Kambojas also practiced Brahmanism. See: Brahmanism of Ancient Kambojas. The modern Kamboj are said to be divided into two divisions of 52 and 84 clans names (the actual number is however some what higher than these figures). Dr J. L. Kamboj observes that more than 15 of the Kamboj clan names overlap with that of the Brahmins and over 80 overlap with other Kshatriya and Rajput clans of northern India. But according to S Kirpal Singh, the respective figures are over 25 overlapping with Brahmins and over 100 overlapping with other Kshatriyas and Rajputs. In his well known book Glossary of Tribes and Castes of Punjab and North-westFrontier Province ,British ethnographer and ethnologist, H. A. Rose, had also observed in early20th century that there is seen an overlap of the Kamboj clan names with that of the Brahmins and otherKshatriyas. Rose also admitted that the reason of this overlap was not clear to him .But, today with all the information provided in the articles in Wikipedia about the Kambojas, it would seem clear as to why there is such an overlap. Kamboj men and women remain to be one of the most important and finest class of agriculturists of India especially in Punjab and Haryana, which is why many of them have a strong physique, as well as aryan features which have been given to them via their ancient Kambojaancestors, ancient Kamboja, an Indo -Iranian Aryan clan of Indo-European family. The Kambojs in both Punjab and in other states in India are found in a variety of other developed nations such as America and the United Kingdom, where they have developed successful businesses and employment. In fact, because of the fact that the Kambojs own most of the land in Punjab and Haryana and therefore work on it to produce wheat, rice and various other food grains and vegetables, it has boosted Punjabs economy and therefore decreased amounts of poverty in the region. See: Vedic index of names & subjects by Dr. Arthur Anthony Macdonnel, Dr Arthur. B Keath, I.84, p 138; Afghanistan, p 58, W. K. Fraser, M. C. Gillet; Afghanistan, its People, its Society, its Culture, Donal N. Wilber, 1962, p 80, 311 etc. Paraskara Gryya-sutram verse 2.1.2; Commentary: Pt Harihar.